On Quai aux Pierres de Taille, a former quai in the now disappeared harbour of Brussels, surrounded by former warehouses and next to the Royal Flemish Theatre, a 60s office tower rises above its neighbours. The style and scale of the construction contrasts with the local urban fabric, but, thanks to its freestanding implantation across the building block, the tower remains discreet and often unnoticed. Currently vacant, this building is to be transformed into a mixed-use complex, comprising a variety of dwellings ranging from compact smart studio units to generous 3 bedroom apartments. The site is cleared and opened up, asserting the visual and physical porosity through the block. Delicate plants combined with larger trees are foreseen throughout the open spaces and in the underground parking, rising through a large opening in its upper deck. The linearity of the existing volume and the porosity of the site are reinforced by the creation of double-high V-shaped colonnades running along the commercial spaces on the ground floor and defining sheltered pedestrian circulations leading to the building’s entrances. Above these colonnades, a lightweight scaffold-like steel structure supports generous balconies and winter gardens. The movable perforated screens provide shading from the sun as well as protection from wind, and blur the opacity of the new white façades that elegantly dissipate into the sky. 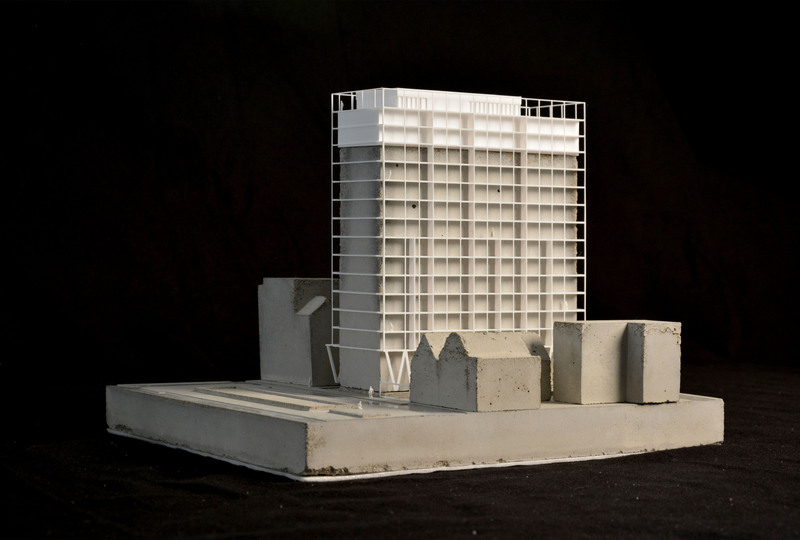 In the South-East corner of the site a mid rise apartment block is added, continuing the street front. The project reinforces the existing potential of the site. It adds a large amount of quality housing in a mixed neighborhood and aims for high density urban life that is less and less depending on car mobility.